Only the strong will survive. Who will come out on top? The NBA playoffs are upon us, with some familiar faces at the top of the bracket, with some surprises mixed into the lower half. Most of these teams were expected to be here, albeit in different seeds than those in which they wound up. The 16 remaining teams will each be seeking the 16 wins necessary to capture the NBA crown. While squad will emerge victorious in 2013? Could you imagine what it would be like if the 8-seeded Bucks stunned the top-seeded Heat in a thrilling 7 game first-round series, shocking the world and sending the best player of his generation home 2 months early? No? Neither can I. Heat in 4. This series will be hard fought. Boston will be a motivated team, but without Rajon Rondo, they are not a very good team. I expect Boston to steal a couple games, but I don’t think Boston has any particular strength with which they can exploit the Knicks’ defense. Knicks in 6. Indiana lost one of their best players early in the season, but they have thrived without Danny Granger thanks to a stifling defense and the emergence of Paul George. On the other side of the matchup, Atlanta has played well after trading star player Joe Johnson in July, but they now lack the go-to scorer they will need in the playoffs. I don’t think Atlanta can solve Indiana’s defense— at least not 4 times. Pacers in 6. Chicago is scary for a 5 seed, but Rose will not return this season, and Joakim Noah has been battling a foot injury. Because of this, the Bulls are not as dangerous as they have been in years past. But they have still found a way to win, and I think that continues in this series. The Nets are a good team, with a big 3 of Deron Williams, Joe Johnson, and Brook Lopez. But I think the Bulls win this series, although it could go either way. Bulls in 7. Houston has been a fun team to watch, and the Harden-Thunder matchup will be exciting, but Houston isn’t good enough to beat OKC. Linsanity is not making it out of the first round. Thunder in 5. If Kobe had not gotten hurt, I would be picking LA here. San Antonio has been beatable lately with Ginobili out and Parker slumping a bit. But without Kobe (and possibly Nash), the Lakers can’t win a playoff series. Spurs in 6. The Nuggets were the team nobody wanted to face— and then the injuries came. Danilo Gallinari tore his ACL, and Ty Lawson and Kenneth Faried are banged up. The Warriors were a great surprise this season, as Stephen Curry’s rise to stardom propelled them into the playoffs. This will be the most entertaining series of the first round. I think Denver’s quickness will give them the edge in transition, and in the series. Denver in 6. Both of these teams cooled off after very hot starts to the season. Griffin-Randoplh will be a matchup to watch. But I think Memphis threw away their season when they traded Rudy Gay— this is not a team that is sending Chris Paul home early. Clippers in 5. The Pacers are a physical team, giving them a chance against the Knicks. But their performance in the season series (one of their wins came with Melo out, and the Knicks beat them in April without Tyson Chandler) suggests that the Knicks have a bit of an edge. The Pacers lack the quickness at the guard position to exploit the Knicks, and Melo should give them fits on the other end. Knicks in 5. These are probably the 2 best teams in the West right now, meaning this series will have higher stakes than your average Conference Semifinal. The point guard matchup will be a must-watch, and the deep benches on both sides will provide for a very close series. The Clippers’ leading scorer is Blake Griffin. OKC’s leading scorer is Kevin Durant. I think that makes the difference in a very close matchup. I like the youth, athleticism, and depth of Denver in this matchup. The Spurs have home-field advantage and could get Ginobili back, but I think Denver has a matchup edge in this series. Denver in 5. The Knicks won the season series and match up very well with the Heat. If the Knicks hit their threes, this is definitely a series they can win. The Knicks can definitely beat the Heat. But the operative word in each of my last two sentences is “can”. I think this series is going 7 games, and game 7 is in Miami. I think that LeBron, like he did last year, will take over in an elimination game. This could go either way, but I’m taking the Heat. Heat in 7. If the Nuggets were healthy, I might actually go with Denver in this one. But with some players out and other players banged up, the Nuggets’ depth is not as scary. I don’t think they have the defense necessary to stop Durant and Westbrook, and OKC’s home field advantage is a huge edge when you consider how rabid their fans are. Thunder in 6. This rematch of last year’s finals should be closer, as the young duo of Thunder stars has had another year to develop. Miami wins the small forward matchup, the guard matchup goes to OKC, and I think the 2 power forwards are about even. But one thing worries me: I don’t think Westbrook has shown he can handle the stage he will be on. I think that brings Wade and Westbrook even, and I think LeBron will take over when it gets close near the end. Heat in 7. I have Miami winning the title, but I could also see them losing as early a round 3, or even round 2. This postseason will be exciting and unpredictable. Let’s see what happens. 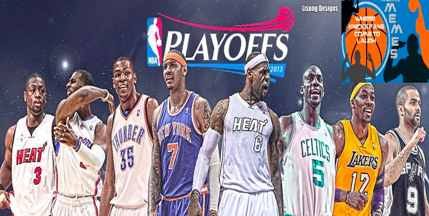 This entry was posted in Articles and tagged KNICKS, Knicks Heat, KNICKS MEMES, nba, nba finals, nba playoff preview, NBA Playoffs, playoff predictions, playoff preview, playoffs, Tommy Rothman on April 20, 2013 by Tommy Rothman.